I enjoyed this book so much more than I thought I would! I was attracted by the pretty cover and the recommendation from a friend, so I got this book from the library. When my copy arrived, I read the synopsis and my enthusiasm came to a screeching halt. This book sounds like a total rip off of Ready Player One. And to be honest, it really kind of is. But somehow, knowing this, I still really enjoyed this. 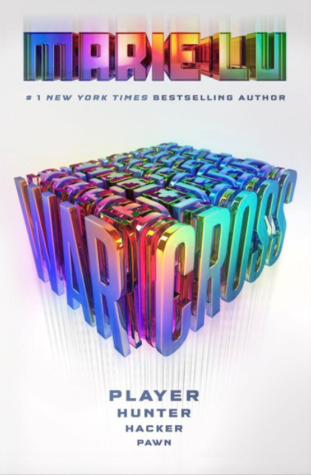 Warcross is about an 18 year old bounty hunter Emika, a girl close to eviction. Out of desperation she takes a risk during the Warcross games and gets caught, resulting in her getting an offer she can’t resist. Now Emika is thrown into a new world where she wants for nothing, with a hot boss too. It’s up to her to discover a new threat and to help stop it. I thought this was a fantastic YA novel, like I said before I was surprised by how much I liked this one. I’ve only ever read The Young Elites and I couldn’t get through that book. So I didn’t really know what to expect. I think Lu did a great job with her main character Emika, she’s a spunky, hacker, bounty hunter with rainbow hair and tattoos. I mean, how cool is that? This book was also really easy to read, I fell into it and the pacing was totally on point. I found myself inching toward the book at times when I couldn’t read it, and that’s the mark of a good book. Why not 5 stars? I felt the romance was really lackluster and underdeveloped, even the guy said himself “perhaps I’ve been too subtle” <— um, YEAH DUDE. I thought this girl just had a weird one sided fangirl crush on the main guy until he suddenly kissed her. There were also some gaps in the game world building and moments when I was confused about how things worked. I don’t think we need an extensive lesson in it, just maybe not so many conflicting statements about the game and how it worked. Anyways if you like YA and scifi, this is the book for you! Take it from a girl who didn’t think she would enjoy it, take the leap and give it a chance! And I am so excited for the next book!! !